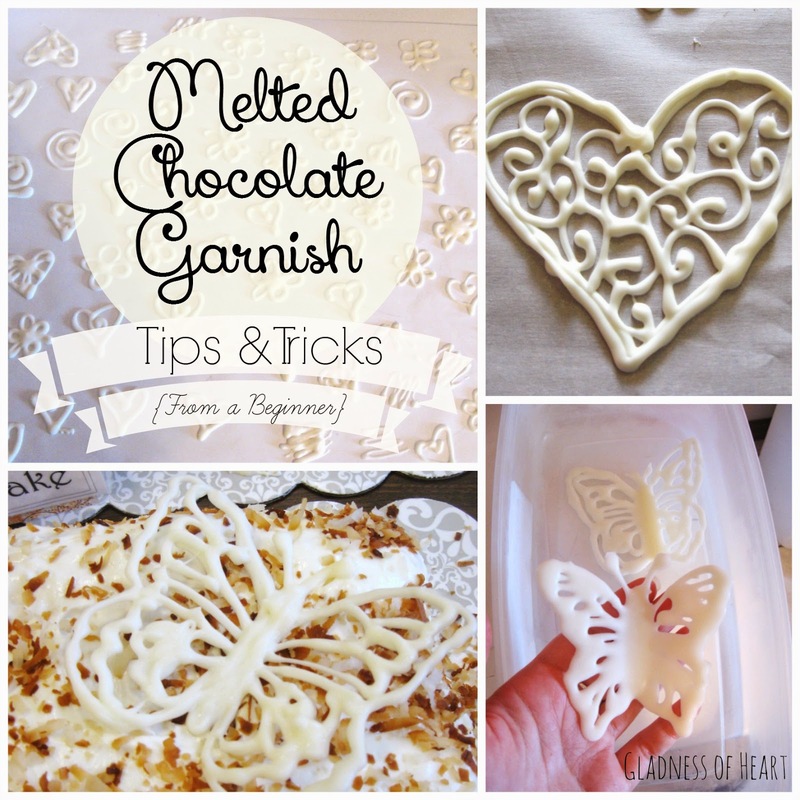 when creating design garnishes from melted chocolate. I'm not sure how important this one really is, but I read that it hardens better than chocolate chips. Not to mention you can buy it in large quantities and it is cheaper than the equivalent amount of chocolate. (and add food coloring for colored chocolate!) or the chocolate version. 2. Melt your chocolate in a measuring cup with a pouring spout. This came in very handy. Melt your chocolate in a microwave safe measuring glass, and as soon as it is melted, pour it into your awaiting bag. At this stage it will be really runny, so it will pour easily. You can use a pastry or icing bag, or- like I did- a regular old ziplock bag. 3. Let your chocolate cool before you work with it! This is the key to success with detailed designs like these chocolate butterflies. As you can see, the butterfly on the left is crisp, delicate, clean and more detailed. While the butterfly on the right looks 'melted', with thick, chunky lines and indistinct details. This is the difference sufficiently cooled chocolate makes! Butterfly number two was made when the chocolate was still very warm. and instead of 'falling' to the parchment paper gently, it pooled. until it has cooled and reached a squishy, not liquid, consistency when you squeeze the bag. I wouldn't recommend popping it into the freezer though- the dredges of chocolate that are stuck to the side of the bag will harden completely, while the bulk of the chocolate will still be runny. This uneven cooling creates clumps and makes it harder to work with. don't actually rest the tip on the surface of the parchment or wax paper, instead hold the piping tip a little above the surface and let the chocolate 'fall' onto the paper, like working with a small rope. 4. Interconnect your chocolate designs, don't make them too thin and wispy. Do you see those adorable little galaxy looking swirls in my picture? And those back and forth zig-zaggy designs in the other shot? Well, every single one of those broke. There was a flaw in there designs, they were too spread out and not connected in enough places to have ample stability. If I had done the same designs only thicker, then it might have worked. So keep this in mind when creating your designs. I made the accident of laying one large parchment sheet of these still-soft garnishes across varying heights of food stuff in our fridge: the result, some of the designs were raised, crinkled and warped because they were soft enough to move with the indentations caused in the parchment paper. A flat cooling surface is best. and then simply following those lines when you pipe your design. a small tragedy by messing up the chocolate when you go to reposition the outline. Do yourself a favor and take a little extra time to trace your drawing on the back of the parchment paper. the less starting and stopping you have, the smoother the end result. B E C R E A T I V E!! Use your imagination to create fun designs and shapes. Draw inspiration from sources around you. but again, make sure your line is thick enough so your letters won't break on you. A little bit of detail can go a long way in bringing your sweet creations up a notch! So, there you have it! Just a little bit of experience that I want to pass on to y'all! Now give it a try yourself!